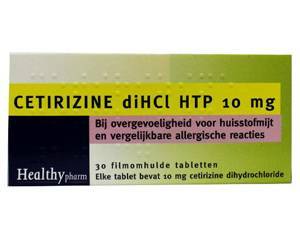 Cetirizine is an antihistamine: a medicine that counteracts allergic reactions in the body. It contains an active ingredient of the same name which quickly reduces allergy symptoms such as sneezing and a runny nose. Cetirizine provides about 24 hours of relief. Skin rash with or without itching. Cetirizine tablets should be swallowed whole with some water. They can be taken with or without food. If the side effects are bothersome, it is advisable to take Cetirizine at bedtime. Continue to use it to relieve your symptoms for as long as you are exposed to the allergen. Cetirizine can also be used preventatively prior to exposure (e.g. before visiting a home with a pet). In this case, you should take the tablet approximately one hour before exposure. Adults and children aged 12 and above: one 10-mg tablet once a day. Children aged 6 to 12: half a tablet twice a day (2 x 5 mg). Do not exceed the recommended dose and read the package leaflet closely before use. Cetirizine is not suitable for children under the age of six. You are due to have any skin prick or patch test to diagnose allergies. This is because antihistamines can prevent or lessen the skin reactions that indicate an allergy, and so can make the test results unreliable. Ask the doctor how long you should wait before taking the test after you have stopped using Cetirizine. Consult a doctor on the use of Cetirizine if you have urinary problems or a medical condition such as epilepsy. It is also important that you tell the doctor what other medicines you are currently taking when you order. This is to avoid potential interaction and to make sure that the combination with Cetirizine is safe. If you are pregnant or breastfeeding you should not use this medicine, or only on the advice of your doctor. Cetirizine may cause sleepiness and dizziness. Avoid potentially hazardous tasks such as driving or operating machinery if you experience these side effects. Do not drink alcohol while taking Cetirizine as this is likely to worsen the side effects.